While we’re currently printing relatively small objects in today’s 3D printers, 3D printing will work at larger scale too. Much larger. In fact, if you have a big enough 3D printer, it becomes applicable to the construction industry. We’ve got a ways to go, but people are exploring the idea of printing buildings. For example, in our recent article, MIT’s Mediated Matter Group Uses 3D Printing to Mimick Nature to Create Efficient Structures, a video shows researchers presenting the idea of printing buildings in concrete with attributes similar to structures found in nature. The D-Shape 3D printer prints a structure called the Radiolaria. Photo credit: Blueprint magazine. But it isn’t just those in academia that are looking into printing buildings. Among others moving forward in this area is Italian engineer Enrico Dini, who has visions of revolutionizing the construction process with his own ideas of 3D printing on a massive scale. In fact, he has built the world’s largest 3D printer for this purpose. Enrico Dini calls himself a “stone alchemist,” and can mimic the method of how rock forms under the seabed. 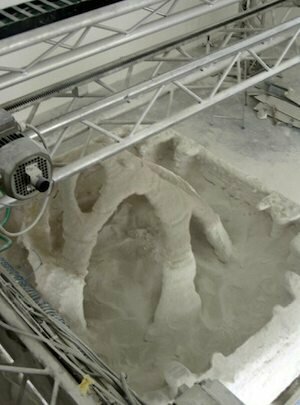 Combining his robotics expertise and his stone alchemy, he has developed and patented a process for printing large structures. With it, he says he can overcome the structural limitations of traditional design methods that constrict the shapes and forms one can build. Affable Enrico told me that his “small team is sitting on a huge opportunity.” I would tend to agree. Their D-shape technology makes it possible to 3D print 6 by 6 by 1m parts. These parts could either be shipped to the construction site or the entire building could be 3D printed on location. The parts made by D-shape resemble ‘sandstone.’ They are comparable in strength to reinforced concrete and the ingredients are the binding material and any type of sand. D-Shape’s materials cost more than regular concrete but much less manpower is needed for construction. No scaffolding needs to be constructed so overall building cost should be lower than traditional building methods. The system works with a rigging that is suspended over the buildable part(you can see it at the top of the first image). The system deposits the sand and then the inorganic binding ink. No water is necessary. Because the two components meet outside the nozzle, the machine does not clog up and can keep up its accuracy of 25 DPI. Enrico and D-Shape are currently talking to lots of construction & engineering companies and architects about their technology. Now, filmmakers Jack Wake-Walker and Marc Webb are creating a documentary called, The Man Who Prints Houses, about Enrico and his quest. The film “follows Enrico as he strives to make his dream of large-scale 3D-printing a reality. From his ambitious business ideas, to financial problems and struggles in his family life, the film tells the story of a visionary inventor shackled by his life’s work…The Man Who Prints Houses drifts from a straight-up science documentary to an intimate portrait of a tortured genius who’s literally laying the foundations of a mind-boggling and truly life-changing technological revolution. We didn’t see any word on the documentary website as to when this film will be released, but we can’t wait to see it.